The same day as Oil prices hit the highest level since Sept. 2008 I put up the first Beta of my new hobby project "The Urban Micro Jungle" (just a PPT put on the web). That oil prices reached new highest the same day was obviously a coincident. But it is a bizarre situation when I launch a project to encourage people to see the beauty around them and the same day "analysts" say that problems with high oil prices include "commuters opting for public transportation and car pools" and "vacations closer to home". To call "vacations closer to home" a problem is close to criminal with the current climate crisis, and it just show how far away the rhetoric is from action when it comes to a low-carbon development. 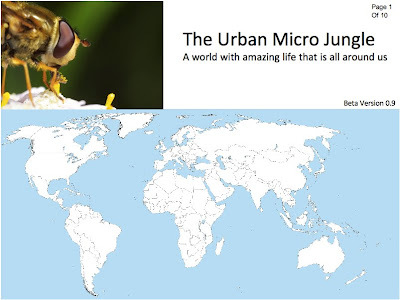 One idea with the Urban Micro Jungle is to get people who use models and work at places that use such assumption to reflect on what they are doing. Not by threatening with a climate catastrophe or how future and current generation are/will be affected, but by showing the beauty around us. And this is a hobby project so I'm allowed to this without assessing the likelihood of such change ever happening, I will just do my best and hope.